Satin linen has the texture, look and feel that can completely transform the decor of tables at a wedding or any other special event, or even at your home. 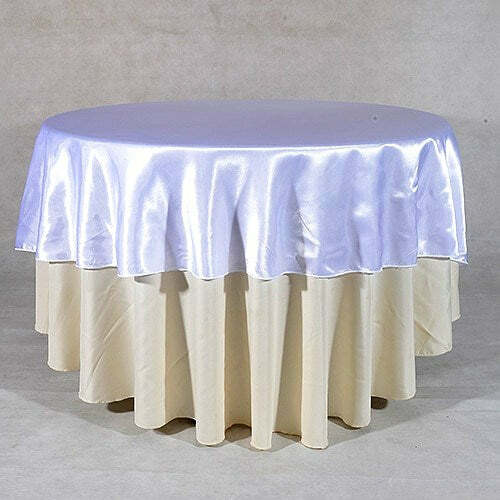 Made from finest quality of satin, our premium collection of satin tablecloths will give you that unique, beautiful finished touch to your tables. Featuring a variety of hues, the collection includes 70-inch, 90-inch and 108-inch satin round tablecloths that are available in color variations specific to suit multiple types of event themes and decor combinations gracefully. Our latest collection of satin tablecloths provides a smooth and glossy surface finish which is wrinkle and stain resistant. Select from a wide range of choices and order online at affordable prices today!